I like this shading variation of N’Zeppel and will definitely use it again! I’d also like to try another piece with several different shading variations mixed together. I’m sure that this would look very cool! I didn’t shade the whole because of various reasons. The most important one is that I’m extremely tired right now but have to post now if I want to have a post for September. The other reason ist that I thought that in this way crazy N’Zeppel would “pop” more from the tile. It didn’t really happen but it’s still good looking. The next two months will be a bit harder to post because we are going to move. ❤ I'm still planning to post at least once per month. However, moving is also the "death" of Inktober this year for me. If you're participating I wish you lots of fun and a lot of stamina so you'll be able to complete the challenge. I'll definitely be folloing Inktober activities an Twitter and I'm looking forward to enjoying all this great rt that'll be posted then. Posted on 29. 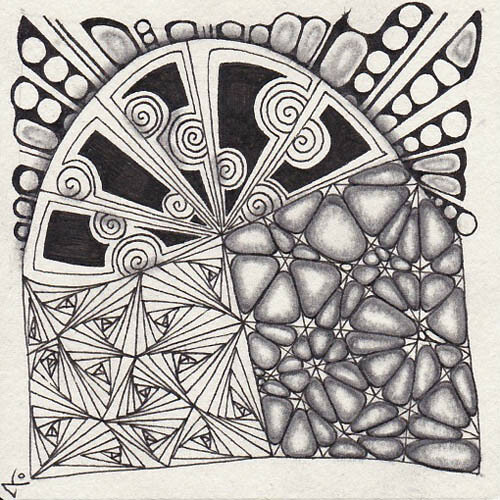 September 2017 by Yvonne LiPosted in challenge, Diva Challenge, ZentangleTagged challenge, thediva, Zentangle. I’m glad you could share your lovely tile with us. Good luck with your move! A lovely tile!!! Succes with the move.